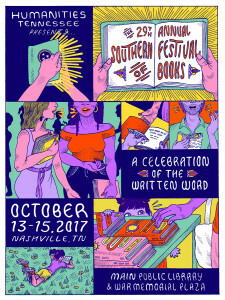 The 29th annual Southern Festival of Books kicked off in Nashville today! I’m heading over early tomorrow morning (sad to miss some great panels today, including my friend Beth Ann Fennelly talking about her new book Heating and Cooling: 52 Micro-Memoirs at 1 p.m. today) where I’ll be on a panel for my novel CHERRY BOMB, and also hope to make it to several others. It’s been five years since my first panel at the Festival, back in 2012, for Circling Faith: Southern Women on Spirituality, with Wendy Reed, Jennifer Horne, Marshall Chapman, and Rheta Grimsley Johnson. Can’t wait to get back there! 12:30 p.m. – 1:30 p.m. – “Radiant Child: The Story of Young Artist Jean-Michel Basquiat” (Basquiat is featured briefly in an MTV video I reference in my novel CHERRY BOMB, since my protag is a graffiti artist). I’d love to hear this panel and buy the book…. 4:00 p.m. – The Path to Publishing: Tennessee Debut Novelists (Susan Cushman and James E. Cherry) where I’ll be talking about my novel CHERRY BOMB, as well as my journey to publishing three books in one year, with three different indie publishers. We’ll be in the Special Collections Room of the Nashville Public Library. 5:00 p.m. – I’ll be signing copies of CHERRY BOMB at the signing venue. 6:30 p.m. – Authors’ reception!